Invasive species are a massive problem worldwide. Defined as nonnative species that become established outside of their native range, and whose introduction causes harm or is likely to cause harm, invasives can disrupt natural habitats, hurt local economies and threaten human health. Invasives cause billions of dollars of damage every year, and approximately 42% of species that are listed as Threatened or Endangered in the U.S. are at risk primarily due to invasives. Invasive species are found in practically every ecosystem in the world—including our ocean. The good news? Everyone can help in the fight against invasive species. For Invasive Species Awareness Week, here are some easy ways you can help stop the spread of aquatic invasive species and protect the waters you love. It may seem like the humane thing to set Nemo free in the ocean, but pet releases pose an enormous threat to native ecosystems. 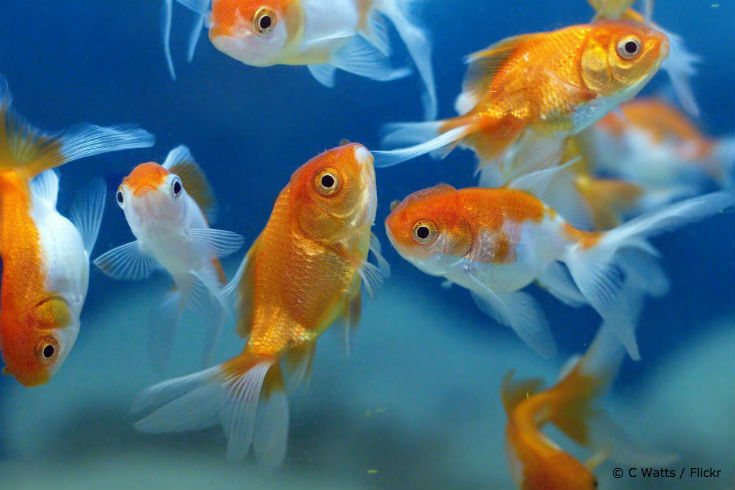 Even something as seemingly harmless as a goldfish can disrupt local food webs by preying on fish eggs and small invertebrates, cause excess algal growth by rooting up plants and releasing nutrients, and harm native fish species by spreading parasites and exotic diseases. Even the huge lionfish invasion in the Atlantic, Caribbean and Gulf of Mexico was likely triggered by as few as six females released in the ocean as a result of the pet trade. Each year, nearly 150 million exotic fishes comprising 2,000 different species are imported into the U.S. for the aquarium trade. Currently, at least 185 different species of exotic fish have been caught in U.S. waters, with 75 of these known to have breeding populations. Over half of these introductions are from people releasing aquarium fish into the wild. Keeping your pets happy and healthy and OUT of our local waterways is one of the easiest ways to prevent the spread of invasive species. 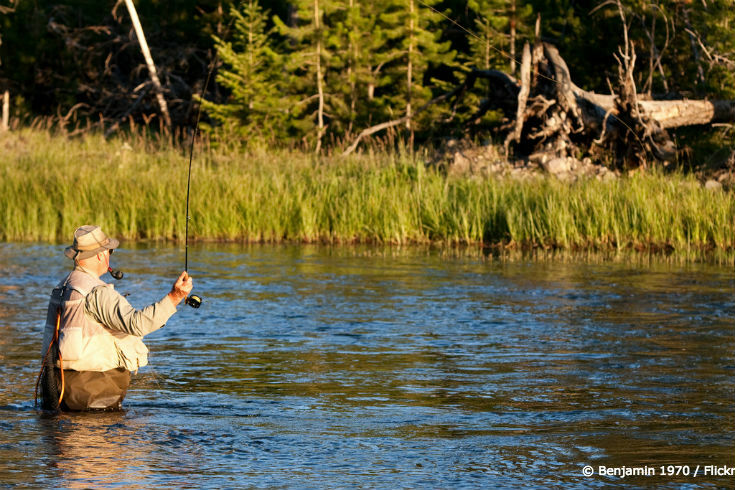 There’s nothing better than spending an afternoon on the water, but be careful no hitchhikers tag along when you leave. After using your motorboat, kayak, paddle board or scuba equipment, be sure to remove any attached mud or plants. And be thorough: even tiny plant fragments could be home to larvae of invasive species! Then, drain all water from bait buckets, motors, scuba gear, waders and any other object that might house liquid. If possible, use hot or salt water to clean the equipment for maximum impact, and allow everything to dry thoroughly before using it in a new body of water. And don’t forget Fido! Dogs, horses and other pets can be perfect vehicles for small invasive species to hop from place to place. 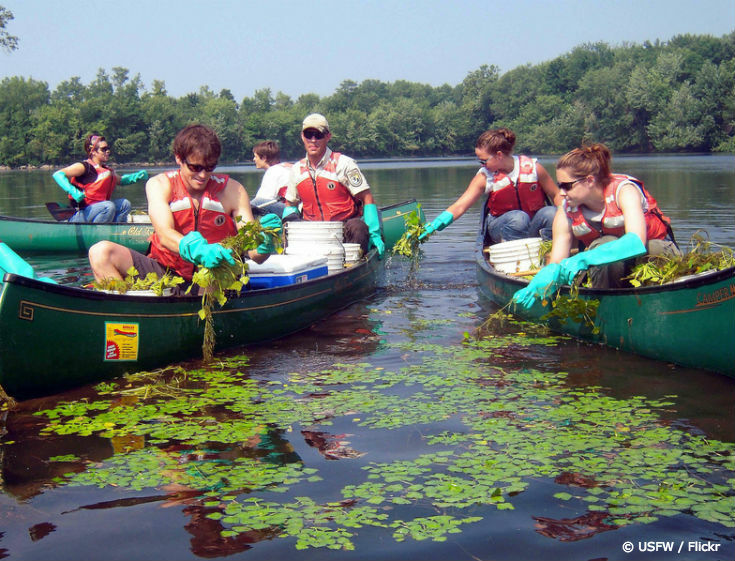 No matter where you live, chances are you’ll be able to find invasive species volunteer opportunities nearby. Check out your closest state or national park’s website to see if they host invasive species walks—many organize half-day hikes where you learn to identify and removal invasive plants. Some state governments, including New Hampshire, Virginia and Massachusetts, organize training programs where you can become a “Weed Warrior” and are certified to conduct removals on state property. It’s easy to combine invasive species removal with other recreation, too—you can hire guides to spearfish for lionfish, or bow hunt for snakehead, for example. Can’t find a removal event nearby? Organize your own! Learn to identify and effectively remove invasive plants in your area (just make sure you’re not accidentally removing a native species). And if you see an unfamiliar plant or animal in your community, report it to a local environmental, state or academic group specializing in invasive species management.